They Just Might Revoke My Mom Card for This…. I’m not anti-Disney, too busy, or boycotting any number of supposed agendas, etc…it honestly just doesn’t look that interesting to me. I know–GASP! My children (a boy and a girl) have both seen the movie, we own the CD (a birthday present to my daughter from a friend), and I think I’m pretty familiar with the basic story line. My kiddos (and their friends) sing the songs around the house and in the van (they do seem to be very catchy tunes.) Once I even played the music during a snowman themed church event to the delight of dozens of girls AND boys–it’s obviously a big crowd pleaser! I have read countless articles and blog posts about the wonderful and not so wonderful (depends upon the viewpoint of writer) themes in the film. Plus, I’ve heard numerous raving reviews from young and old alike about the movie. Still…nothing. My husband even wants to see Frozen to find out what all the hubbub is about. To which I have to say, “Watch it with the kids.” It’s just not my cup of tea. I should admit that I’m not a huge fan of children’s movies or animated flicks of any kind. But as a Mom, I’ve had to watch several more than my fair share (we’ve all been there!) Many times, to my surprise, I find that I actually end up enjoying the movie. There are even a few…like The Incredibles and Megamind…that I would watch repeatedly. Most recently we’ve seen The Muppet Movie and Sherman and Mr. Peabody. Both two thumbs up! So, I really can’t explain my reluctance to sit down and watch Frozen. No biggie, right? Move on. But just when I thought that most of the hype surrounding this movie had sort of died down (like maybe I was in the clear of being “outed” as the only Mom on the planet who had not seen it), a funny thing happened to me at Wal-Mart…. The look of disbelief on her face took me by surprise…suddenly I was stammering to say that I’d heard nothing but good things about the movie and that my kids really liked it…especially my daughter! In a last-ditch effort I threw out there that she should try a larger Wal-Mart or maybe Party City…I wished her luck and couldn’t get out of the aisle fast enough! I scrambled past her cartload of kids–who were also wearing shocked expressions and staring at me. Yikes…what just happened? Heart beating frantically, I realized that I felt guilty for not having seen the movie! Obviously, this was a big Mom fail on my part to say the least. As I share this, it all seems pretty silly. Angst over a movie, I mean. But I guess that I while I don’t really plan to see it, I do understand the huge impact that it’s had on this generation and their parents and families. I can see it now…Frozen will be its own category on Jeopardy someday. It will probably show up as movie trivia during the previews at the theatres for years to come. Down the road we’ll have a whole army of baby girls named for the movie characters. Suddenly, Annas and Elsas (and maybe even Olafs for the boys) will fill up classroom name lists and sports team rosters! We’re not just talking about national impact, either. 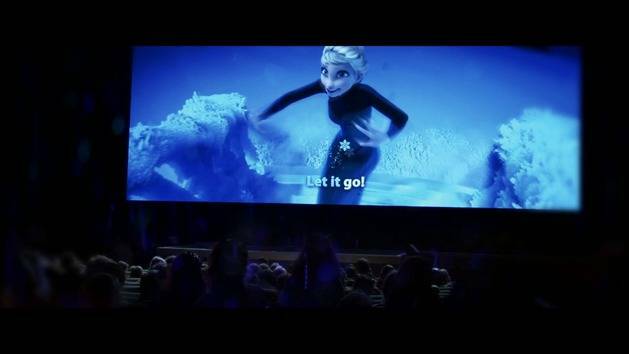 Frozen is a major hit and a force to be reckoned with worldwide. I hear that there are plans for a Broadway musical and maybe even a sequel. The merchandise is everywhere and there’s probably much more on the way. And I will have missed out on all of this! Oh well. Let it Go….